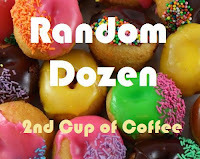 Linda is hosting her weekly random dozen and she had a bit of a Hall and Oates theme going in her original post. Come play along...just answer these questions on your own blog and link back here to share your answers. 1. On an average, how often do you splurge and buy something for yourself? 2. Are you more like Hall or Oates? Just kidding. Real question: What is the last creative project you began/finished? Feel free to post a pic of it. I'd say definitely Daryl Hall. Sorry, I liked that question better. I've been busy moving house and haven't done too much creative stuff lately...does baking cookies count? I'm going to say it does because that's something I've done recently...heath bits peanut butter cookies... the recipe is on my blog if you're interested. And believe me when I say you should be because they were delicious. 3. OK, Goldie Locks, do you consider your house too big, too little or juuuust right? 4. What is your favorite outdoor chore? 5. If you knew that cigarette smoking was not bad for your health but would be a weight loss tool, would you use it? Why or why not? 6. On a road trip, would you rather drive or ride? 7. What do you consider a trivial pursuit? 8. This weekend, we downloaded the movie "Duplicity" with Julia Roberts and Clive Owen. Within 5 minutes, I was bored and annoyed, but I kept watching 5-10 minutes at a time hoping it would get better between small chores. I finally gave up and Jorge watched it alone, and then regretted wasting that time because he disliked it intensely, too. So ... how long do you watch a movie or read a book before giving up on it? I give a book a few chapters before giving up...it has to be really really bad for me to stop reading. Not sure I've ever really given up on a movie...I generally sleep watch to the bitter end. 9. Is there a song that you really love but are embarrassed to admit because it's not cool or it's racy or because it's by Hall and Oates? Hey now...Hall and Oates had some classics...I still remember dancing with my then boyfriend-now husband in college to Kiss on my List. To answer the question though..pretty much anything by Abba, pretty much anything by The Carpenters....but I'm not embarrased by it...I did just put it out there on my blog after all. I like a very wide range of music so I think I can be forgiven for any that might be considered uncool by people who say they never listen to that kind of music but when it comes on the radio they somehow know all the words. 10. On a scale of 1-10 (10 = extremely) how spontaneous are you? well...before I met my hubs I think about a 2...he might say I was closer to a 1. He was/is a 10+ and has pulled me along with him enough that I think I'm about a 5 now. He might possibly say 4 but he's not answering these questions so we'll go with my answer which is 5. 11. Are you a food and/or beverage snob? No. That being said though...I do love very fine dining and gourmet meals and appreciate the art and effort and presentation and of course the taste of a a carefully prepared meal. I also love a bbq in the backyard and pizza right out of the box too -I'm definitely not a food snob. I really didn't know a whole lot about wines before moving overseas so I'd say I'm more of a wine snob now than I used to be. I wouldn't actually call it snobbery...it's just that I'm more particular about the taste now than I was 10 years ago. Plus once you hit a certain, ahem, age every calorie counts so I'm a little bit more aware of how I'm 'spending' my calories. 12. Who/What are you trying to control in your life? well now...I see this week we've saved the biggie for the end....hmmm....how to put this...well, I've been happily married for 25 years so obviously the control issues there have been resolved...and my children are college students so nearly all grown up... I confess I still try to put my .02 in there quite often...I like to think I've let go of the control part and now its just sharing my wisdom : ) That sounds so much nicer don't you think? I like to be in control (see spontaneity question above) in certain settings and if we're in a meeting or working on a commitee project I probably tend to take the bull by the horns and organize/take charge to a certain degree. I love people and enjoy working in groups... I just hate it when no one is running the show and everyone is saying I don't know what do you think? and they respond with well I don't know what do you think? That kinda makes me crazy. All of my married life it seems God has kept us moving... new home, new town, new schools, new country...all make me feel very out of control, at least initially. And then it seems that just when I get really comfy off we go again...I've had to release a lot of my need for control and just roll with where life has taken us. That has been a very good thing. These were fun questions, weren't they?! "I just hate it when no one is running the show and everyone is saying I don't know what do you think? and they respond with well I don't know what do you think? That kinda makes me crazy." Makes me absolutely nuts, too! In that particular setting, I do end up trying to be in control just so we can get something done. I enjoyed your answers. I'm afraid it would be too time consuming to answer all of them and link to yours. It also makes me crazy when no one wants to take charge or seem to know what they're doing. Also loved your "sharing your wisdom" response. This is another great week to learn even more about you! I love Kiss on my List! Sometimes it still comes on with our radio stations flash back 80's hour! Yessss... I splurge on my kids and my grandbaby a LOT more than on myself... but I do splurge on me too! LOL at #3 -- in light of #2 where you tell us you've just been moving your house - I HOPE your new one IS jusssssst right! I'd be so SAD for you if it weren't. I totally agree with #11 too! Fun answers - and good ones! I so agree with you on Nr. 11 and 12! I love to "share my wisdom" with my kids too! :) And when people don´t know what they want....drives me nuts! Can I ask, how and why you live "on the other side of the pond"?? Was it work related? And are you planing to move back to the US? Sorry, I´m new here and am just interested. Great answers :) I think you undersell yourself on the spontaneity - anyone who has lived in so many places and traveled so much has to be pretty spontaneous to survive! #9 -- so true! LOL! And I listed Abba as my uncool fave. Plus, I didn't know Hall & Oates weren't cool until Lidna made this meme! #10 -- my Amoeba and I are just opposite. As a trained scientist he likes his Ts crossed and his Is dotted. Good stuff, Joyce. I'm probably the more spontaneous of the two of us. Larry will mull things over for eons before making a decision.